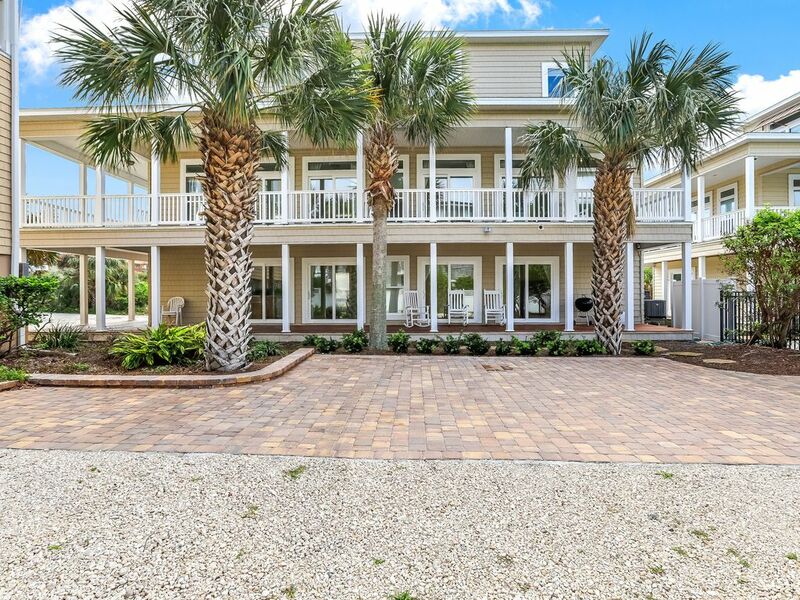 Spacious Oceanside Beach Home – More than 3,000 square feet and 1,500 square feet of porches. Expansive views! Luxury master suite with a private bath that includes a tiled shower and jetted tub. From the master, step out onto a private balcony overlooking the beautiful Atlantic! Main floor has plenty of seating, access to a large porch and another bedroom with a private bath. Lower level includes a kitchenette plus three other bedrooms with plenty of sleeping spaces. View the photo tour to get a better idea of sleeping arrangements. Step outside and follow the path to a semi-private pool or turn right for a short walk to the beach. Publix is conveniently located across the street for all of your grocery needs! Grab a snack or bottle of wine and enjoy them on any of the many porches. St. Augustine is a short drive over the bridge where you will find lots of shopping, restaurants and history. You can check out the oldest schoolhouse, a variety of churches and tour Flagler College with its beautiful Tiffany pieces. Or step back in time and stop by the Fountain of Youth or the old masonry fort. Take a trolley tour or walk down St. George Street and enjoy boutiques, bistros, gift shops and more. There are plenty of water sports and golfing nearby. Pets are considered in this home. Gather up your family or friends and book today! Semi Private Pool; shared with three rental homes. We had a large group and this property was perfect for us. The pool is located just steps from the house and the beach is a short walk down the path. The grocery and several decent restaurants were also within walking distance and downtown is a short drive away. We did have a small issue that was quickly addressed by management. I would recommend this vacation home to others looking for a reasonably price house that sleeps 14 and offers a great location. We'll be back! Love this area. We all had our own space and the house was great. Easy walk to the beach and Publix. Lots of Uber and lyfts taken during our stay well worth the quick ride into town. Thank you for your hospitality. Hi Colleen. We are glad your group enjoyed your stay and hope you come again! Unfortunately we had a big incident on our last night , the stove caught on fire, we informed immediately to person in charge , no answer on her side , fortunately my husband knew where the fire extinguisher was, it was never shown to us when we got there . It got fire because there was grease underneath. This was reported at 19:17 , did not get an answer at all ,until 22: 21… very late response, Dinner and breakfast was ruined , but the worst was being afraid of our family (grandkids already asleep). Following day land lord showed up at 10:00 am just when we were ready to leave the unit, we had to have breakfast elsewhere ( party of 12 ), impossible to use the stove, it was a very disappointing end for our vacation, we really expect a compensation for this awful incident. Mistakes happen and in this instance the mistake was made by the guest and they failed to take responsibility for that mistake. We solicited the assistance of a long time appliance repair person in St Augustine and we have pictures of the stove immediately after the incident. The pictures indicate that the only area that was showing any grease was directly over the element on the stove top that was used by the guest. This is further substantiated upon inspection by Island Appliance of Saint Augustine. There was no maintenance or grease build-up anywhere else on the stove. The fire extinguisher was a located in the kitchen and utilized by the guest. The only emergency number needed for a fire was 911. The guest's only concern is why they weren't able to cook breakfast in the next morning and before their departure; there was no concern that their negligence threatened both person and property. Great home near the beach. Lots to do in the area. Beautiful home and perfect location! Our group of 11 had plenty of space and rarely left the house during our stay because it was so amazing! We’ve stayed at several rental properties and this one was by far our favorite. Ideal vacation spot. Ocean view estate property with pool and direct beach access. Spectacular Ocean Views. Only 5 minutes to historic downtown St. Augustine, America's oldest city. A short drive to Daytona, two airports and World Golf Village.